We’d love your help getting the word out about our new online magazine. 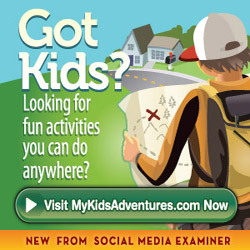 Below you will find resources to help let your friends and peers know about My Kids’ Adventures, including video, images, factoids, tweets/LinkedIn/Google+/Facebook updates and more. You can embed the below video into any of your blog posts. Who is behind it? This site is a property of Social Media Examiner and was founded by Michael Stelzner. What type of content do you publish? 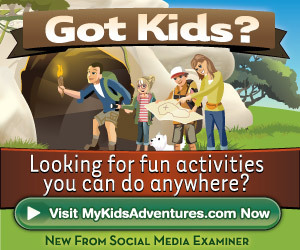 Think indoor camping, glow in the dark bowling in your home, how to make a Star Wars movie with your kids, how to have a backyard water Olympics and so on. The sky is the limit! Why create this resource? The founder, Michael Stelzner, has three young girls who are growing up quickly. They were finding adventure with their gadgets. Mike wanted to create a resource for busy parents like him who want to bring adventure back to the family. Do you have a podcast focused on business or working professionals? Want to explore how we launched this site in an interview? Michael Stelzner is available for limited appearances. Email emily@socialmediaexaminer.com for details.